For the Month of April students will focus on the virtue of courage. Courage is one of the four cardinal virtues, more commonly referred to as fortitude. When we think of courage we tend to associate it with bravery. However, courage is more than just bravery. We want our children to know that courage is having the ability to strengthen ones own mind. It is the virtue by which one meets and sustains difficulties and yet is not deterred from the pursuit of good. Moral courage is the ability to act rightly in the face of popular opposition. As Catholics it takes deep courage to attend to our faith when popular opinion and media say otherwise. We hope that this month, students will have opportunities to strengthen their minds. 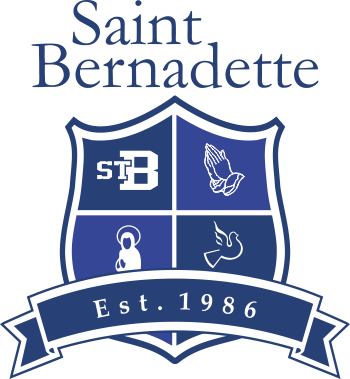 This coming September St. Bernadette School will be having the Stingers Activity Club. This is a before and after activity club. Please read the attached brochure for details about this program. SSVP is looking for a girls’ used bike in good condition for an 11 year old girl. Please call our voice mail @ 604-785-4334 to leave a message. The SSVP is also starting to collect used backpacks for our street ministry. If you could save any backpacks in June that you will be replacing we would appreciate it. The backpacks can dropped off in the gathering room of the church in the SSVP box. Jean’s Day is on Friday, April 30th. Students are permitted to come to school in jeans. Students who will be participating in BC Childrens’ Jeans’ Day are required to bring in a $2.00 donation, with their donation they will receive a BCCH Jeans’ Day button. It has been brought to our attention that at times there are safety issues in the parking lot. On occasion the safety cones have not been put out in the morning, we ask that you take extra precaution on such days. Please do not drop off your child in front of the school, please observe all safety rules. Mark your calendars for pick up of plants and sale of Kindergarten and Grade 1 plants on Tuesday, May 5. If you have any questions, please contact Mrs Fraser, Mme Peck, Mrs Hillard or Mrs Schollen at the school. Thank you for your support.